Cardinals are named for the scarlet robes of Roman Catholic cardinals, but only the male birds are all-red. Cardinals have a stout bill for cracking large seeds such as sunflower seeds. Relatively short wings make it easy for cardinals to maneuver when flying among shrubs and small trees. Females are tan with red highlights and a red-orange bill. Juvenile cardinals are well camouflaged in brown with black bills. We’re surrounded by mountains of snow in this old-fashioned winter, but in Westborough we can tell that spring is on the way. Days are getting longer, and birds are beginning to sing, including everyone’s favorite, the cardinal. 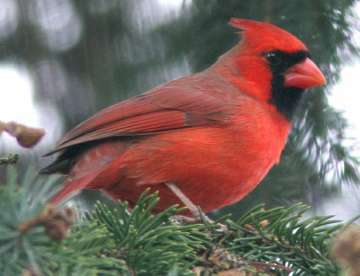 You might hear a northern cardinal (Cardinalis cardinalis) when you’re out shoveling snow or refilling a bird feeder. Since mid-January, adult cardinals have begun trying out their songs. Last year’s young are learning and practicing theirs as they hear and imitate the adult cardinals around them. Listen for the cardinals’ “wa-cheer, wa-cheer, wa-cheer” or “whoit, whoit, whoit.” These distinctive parts of their song become clearer and louder as the season progresses. As the birds’ bodies respond to the lengthening days by producing hormones for the upcoming breeding season, the song centers in their brain enlarge and develop. We usually think of male birds as the singers, showing off their songs to claim territory or attract a mate, and female birds as relatively silent, but both male and female cardinals sing. We’re just more likely to notice males. Not only are they bright red, but they also perch in conspicuous places to sing. The females are tan and brown but with enough red to catch your eye. Both sexes get red pigments from their food, especially the berries and insects they eat in August-September when they replace their feathers. Like many other songbirds, cardinals have a double voice box. In the case of cardinals, the left side makes the low notes and the right side makes the high notes. Cardinals sing an average of 9 songs, eventually running through them all. As cardinals learn their songs, they pick up the local dialect. The cardinals in various parts of the country sound somewhat different – at least to other cardinals. As the songs of both male and female cardinals are getting stronger, cardinals’ colors are getting brighter, just in time for the breeding season. For cardinals, this change comes from wear and tear. The new feathers that grew in last August-September were tipped with brown, so in fall and winter, male cardinals seem to wear a shawl of brown that dulls their appearance, as our photo shows. By spring, the tips have worn off, leaving the bird brighter and redder. A similar wear-and-tear change takes place in some other birds, such as European starlings. If you suspect that the same pair of cardinals visits your yard year-round, you’re probably right. Cardinals don’t migrate. Many – but not all – join other cardinals in flocks in November-December through February-March. The pair in your yard may be among those that stay in one place. At this time of year, you might still see a flock of cardinals. By now, last year’s young look like adults. Within the pecking order of a flock, older birds are dominant to younger ones, and males are somewhat dominant to females. Flocks break up as birds drop out to claim territories and pair up for the breeding season. At a bird feeder and on the ground underneath, you might notice a male and female cardinal feeding separately early in the year but staying closer together as spring arrives. Eventually you might spot them mate-feeding, where the two touch beaks as the male passes a seed to the female. Mate-feeding is part of courtship in cardinals (and various other birds as well). The birds usually continue mate-feeding through the spring, while the female builds a nest and then stays on it to warm the eggs and newly hatched chicks. Eventually both male and female end up busily feeding their fast-growing chicks. Male and female cardinals pair for the breeding season, and the same two birds sometimes pair up season after season, on the same territory. Typically in February-March, the males establish territories, singing to make their claim. Two males sing back and forth, one answering the other, to establish boundaries. Often they match each other’s songs. When a female joins a male in a territory, the two sing back and forth in a similar way. A female cardinal is attracted to a male on the basis of the territory, the brightness of his feathers, the quality of his song, and his mate-feeding. All of these things help to show off the male’s health and ability as a provider, which will be put to the test when the time comes for the male to bring food to the female on the nest and to the chicks. Once a territory and a pair bond are established, the male cardinal chases away other males, and the female drives other females away. You may hear the pair staying in contact with frequent “chip” calls. The pair may nest several times, starting in April and continuing to early September. The female does most of the nest-building. You might see the pair flying around together, with the female gathering nesting material and the male trailing after her, guarding his mate from other males. With no leaves out yet, the cardinals are likely to build their first nest in a dense evergreen tree or shrub. Eastern red cedars (Juniperus virginiana) are a common choice. Later on there are more possibilities. Cardinals often nest in the same leafy shrubs and thickets that robins and catbirds like. Cardinals build a cup-shaped nest with four layers – first stiff weed stems, then leaves such as maple and beech and possibly some paper or plastic, then shreds of grapevine or other bark, and finally a lining of rootlets and fine weed or grass stems. This nest is not as safe as, say, a cup nest inside a tree hole, such as bluebirds and tree swallows make. An open cup nest has less protection from weather and predators. Only about 15-35 percent of cardinal nests are successful. If the eggs or young are lost, the cardinal pair promptly builds another nest elsewhere. They may nest 1-4 times per season. Cardinals lay an average of 3 eggs, which are white with brown speckles. The female lays one egg per day. Like many other birds, the female has a special internal pouch that stores the male’s sperm. This arrangement allows the next egg to be fertilized as soon as one is laid. The nest is home only for a short time. The female incubates the eggs for 12-13 days. The chicks grow up fast, spending only 10-11 days in the nest. When they leave, they perch on nearby branches for 10-12 days, keeping very still and being fed by the parents. After that, they follow the parents around, learning the where, what, and how of finding food. About 40 days after leaving the nest, they’re independent and the parents may chase them away. The last young of the season may stay with the parents and form the beginnings of a flock. The name northern cardinal seems strange, since cardinals are relatively new to northern states. They’re not exactly newcomers to Massachusetts, but they’ve only been nesting here for the last 50 years. Louisiana and Mississippi are the states most densely populated with cardinals. Cardinals have expanded their range northward thanks to warmer winters, bird feeding, and increased development, which has brought more edge environment and more ornamental shrubs suitable for nesting. Other birds that have also been moving northward include the tufted titmouse, northern mockingbird, and red-bellied woodpecker. So when you step out the door to pick up the morning newspaper, ignore the snow and keep your ears open for the sound of spring in the cardinals’ song – especially if you or your neighbors keep a bird feeder filled with sunflower seeds, the cardinals’ favorite.